Labour Day is celebrated on the first Monday of every September, and rightfully, is a statutory holiday throughout Canada. The Canadian labour movement can justly claim the title of originator of Labour Day. Peter J. McGuire, one of the founders of the American Federation of Labour has traditionally been known as the 'Father of Labour Day'. However, historical evidence indicates that McGuire obtained his idea for the establishment of an annual demonstration and public holiday from what was already occurring in Canada. Earliest records show that the Toronto Trades Assembly (TTA), perhaps the original central labour body in Canada, organized the first North American 'workingman's demonstration' of any significance on April 15, 1872. The parade marched smartly in a martial tread accompanied by four bands. About 10,000 Torontonians turned out to see the parade and listen to the speeches calling for abolition of the law which decreed that trade unions were criminal conspiracies in restraint of trade. The freedom of 24 imprisoned leaders of the Toronto Typographical Union, on strike to secure the nine-hour working day, was the immediate purpose of the parade, on what was then Thanksgiving Day. It was still a crime to be a member of a union in Canada although the law of criminal conspiracy in restraint of trade had been repealed by the United Kingdom parliament in 1871. Also in 1872, just a short month following the TTA demonstration and parade, railroad workers and other craft workers established the first significant cross-occupational organization in Canada, in Hamilton, Ontario. Known as the Nine Hours Movement, workers formed Nine Hour Leagues across southern Ontario and into Montreal, Sherbrooke, and Quebec City, Quebec. The leagues grew out of workers' demands for the nine-hour working day - a reduction of two to three hours for most wage earners. League members argued that reduced hours would improve the quality of life for workers. All society would benefit from the reduced hours, Nine Hour advocates explained, because shorter hours meant more time for learning, family, and community. When employers showed no inclination to grant the shorter working day, the Nine Hours Movement planned a series of general strikes. When this strategy was tested in Hamilton in May 1872, it unfortunately failed. The strike began on an impressive note when 1,500 workers paraded through the streets. However, when the employers proved unbending in their opposition to the union, the workers gradually returned to work and the strike was lost. The Nine Hours movement never recovered its former energy, although Nine Hour Leagues did continue in some towns for several more years. Together, these local leagues founded the Canadian Labor Union, a precursor of the Trades and Labor Congress of Canada formed a decade later. Toronto and Hamilton were not the only cities to witness labour demonstrations and parades in 1872. On September 3, 1872, members of seven unions in Ottawa, Ontario organized a parade of more than a mile long, headed by the Garrison Artillery band and flanked by city fireman carrying torches. The Ottawa parade wound its way to the home of Prime Minister Sir John A. MacDonald, where the marchers hoisted him into a carriage and drew him to Ottawa City Hall by torchlight. ‘The Old Chieftain', aware of the discontent of workers with the laws which made unions illegal, in a ringing declaration from the steps of the City Hall, promised the marchers that his party would 'sweep away all such barbarous laws from the statute books'. The offending conspiracy laws were repealed by the Canadian government in 1872. The tradition established by the Toronto Trades Assembly was continued through the remainder of the 1870's and into the early 1880's. In 1882, the Toronto Trades and Labour Council, successor to the TTA, decided to organize the annual demonstration as well as a picnic for July 22. The council sent an invitation to Peter J. McGuire of New York requesting his services as a speaker for the occasion. McGuire was the founder and general secretary of the United Brotherhood of Carpenters, which had organized the previous year. It was in the same year, that McGuire proposed at a meeting of the New York Central Labour Union that a festive day be set aside for a demonstration and picnic. Labour Day was first celebrated in New York on September 5, 1882. It is apparent, however, that the custom had developed in Canada and the invitation sent to McGuire prompted his suggestion to the New York labour body. Soon pressure for legislation to declare a national holiday for Labour Day was exerted in both Canada and the United States. Finally, after years of lobbying Ottawa, the government of Sir John Thompson enacted legislation on July 23, 1894, with the Prime Minister piloting the bill through Parliament against the opposition of some of his Conservative followers. 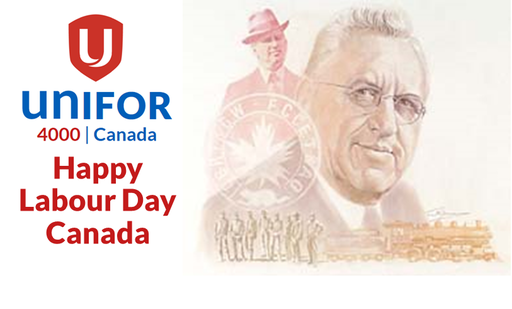 Canadian trade unionists have ever since, celebrated this day that’s been set aside to honour labour. The first Labour Day parade was held in Winnipeg in 1894, and was two miles long. There can be little doubt that the annual demonstrations of worker's solidarity each Labour Day in North America owe their inspiration to a small group of 'illegal' members of the Toronto Trades Assembly.